The names at the outside linebacker position for the Colts have been picked and prodded. One of the game’s finest pass rushers over the past decade. Great edge setter in trying to limit the opponent’s running game. The 1st round pick who racked up 13 sacks in winning ACC Defensive Player of the Year last year. Not much is known about the five-year NFL veteran who has been lost in the shuffle with some of the bigger named Colts free agents this offseason. Sidbury showed flashes of potential in Atlanta (four sacks as a backup in 2011) and now he is hoping to take advantage of a new environment in Indianapolis. “This league is about opportunities and when you get those, you’ve got to make the most of it,” Sidbury said on Monday’s “Ride with JMV”. 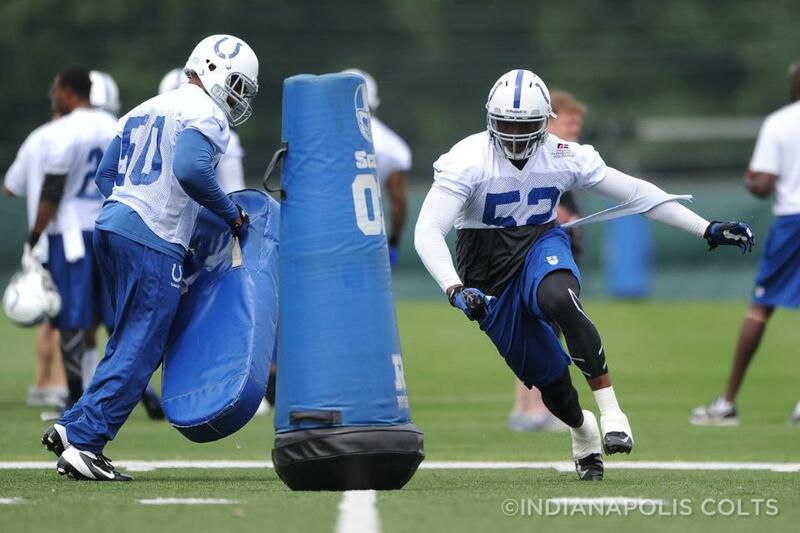 In moving to Indianapolis, Sidbury is also adjusting to life as a standup linebacker in the Colts 3-4 defensive scheme. He feels the transition has gone pretty smooth as Sidbury’s clearly understands the mantra around his new locker room. “As you know I’ve been introduced to the whole “Build the Monster” theme and building this defense to be a top-10 defense in the league,” Sidbury said. When Sidbury’s position coach Jeff Fitzgerald was asked about the depth on the edge a few weeks back he alluded to a few other names besides Mathis, Walden and Werner. Sidbury’s name would fall into that category and he’s grateful for an opportunity in such a welcoming atmosphere.